Aim: The aim is to evaluate the obturating potential of thermoplasticized gutta-percha, mineral trioxide aggregate (MTA), and Biodentine in simulated internal resorption cavities. Materials and Methods: Thirty human extracted teeth with single canal and mature apex were collected for the study. Access cavity was prepared in each. For all the teeth, standardized instrumentation was done to apical size of ISO #50 K stainless steel hand file. Following instrumentation, at the length of 6 mm short of working length, internal resorption cavity was simulated using Gates–Glidden drill, as the canal of the selected teeth was wide enough and thus widening of the canal occurred only at the desired working length. The teeth were radiographed to check internal resorption cavity. The teeth were randomly divided into three groups; ten teeth in each group. Samples were obturated as follows: Group 1 – thermoplasticized gutta-percha, Group 2 – MTA, and Group 3 – Biodentine. Samples were stored at room temperature for 48 h. After 48 h, samples were evaluated radiographically and microscopically using Dental Operating Microscope. Statistical analysis of the results was performed using Kruskal–Wallis test. Results: Results obtained were statistically significant. Conclusion: MTA and Biodentine showed better sealing than thermoplasticized gutta-percha. Many materials have been evaluated in “ex vivo” study designs to examine their abilities to fill internal resorption defects., Various materials available for the treatment of internal resorption include mineral trioxide aggregate (MTA), glass ionomer cement, Super EBA, hydrophilic plastic polymer (2-hydroxyethyl methacrylate with barium salt), zinc oxide eugenol and zinc acetate cement, amalgam alloy, composite resin, and thermoplasticized gutta-percha administered either by injection or condensation technique. Perforating internal resorption may complicate the prognosis of endodontic treatment due to weakening of the remaining dental structure and possible periodontal involvement. However, the prognosis of the tooth can be influenced by the biomaterial employed for the treatment. The present in vitro study was carried out in the Department of Conservative Dentistry and Endodontics. Thirty Human Permanent Maxillary Central Incisors were collected for the study, with wide and single canal and this was confirmed radiographically free from root fractures, caries, or other defects were collected for the study. The samples were cleaned using ultrasonic scaler, disinfected and stored in 10% formalin solution. 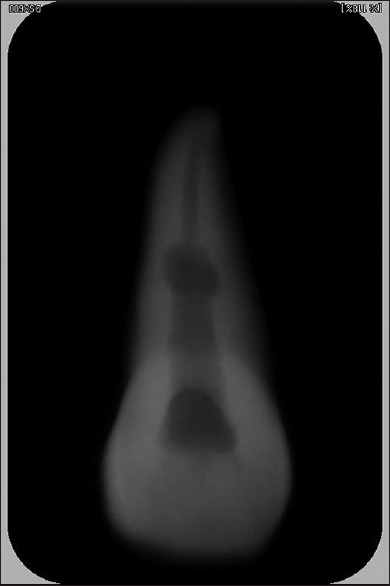 The samples were radiographed to check the patency of the root canal. The access cavities were prepared using round diamond burs (BR40, MANI Co.). Straight line access was established, and lingual shoulder was removed using number 1 and 2 Gates–Glidden drills (MANI Co.). Working length of each root canal was established using ISO #15 hand K-file. Standardized preparation was done upto ISO #50 K hand File with 2° taper, and the canals were irrigated intermittently with normal saline and 2.5% sodium hypochlorite solution. At the working length of 6mm short of apex, IRC was simulated in each sample. No. 1 and 2 Gates-Glidden drills (MANI Co.) were used for the simulation. The IRC was simulated without sectioning the samples, as the Gates-Glidden drills were introduced from the coronal aspect. The Gates-Glidden drills were rotated once they reached the desired working length, i.e. 6mm from the apex and lateral pressure, i.e. pressure in the mesiodistal direction was applied to simulate the IRC. The prepared cavities were verified with the help of radiograph [Figure 1]. The apical 6 mm of all the samples (i.e. is apical to the IRC) was obturated with the help of the Apical plug formed by the Master Cone GP and AH Plus sealer (Dentsply DeTrey) [Figure 2]. Now, the samples were randomly divided into three groups, where n = 10 for each group. All the samples of this group were completely obturated (coronal to the apical plug) with thermoplastic gutta-percha using the obturating Gun (Denjoy Cordless Gutta Percha Obturation System) and condensed vertically using #2 Finger Plugger (Dentsply Maillefer). All the samples of this group were completely obturated (coronal to the apical plug) with MTA (ProRoot MTA, Dentsply). The MTA was mixed manually on a glass slab using a stainless steel cement spatula. The mixed MTA was carried with the help of a Messing gun and placed inside the root canal. The material was vertically condensed with the help of #2 Finger Plugger (Dentsply Maillefer). All the samples of this group were completely obturated (coronal to the apical plug) with Biodentine (Septodont, St. Maur-des-Fossés, France). The preproportioned capsule of Biodentine was manipulated in the amalgamator according to the manufacturer's instructions. The mixed Biodentine was carried with the help of a Messing gun, and placed inside the root canal. The material was condensed vertically using #2 Finger Plugger (Dentsply Maillefer). All the samples were examined radiographically [Figure 3] and then exactly at the center point of the IRC they were sectioned using a diamond disc and observed using dental operating microscope (Labomed) under the power of ×2.5 magnification [Figure 4]. 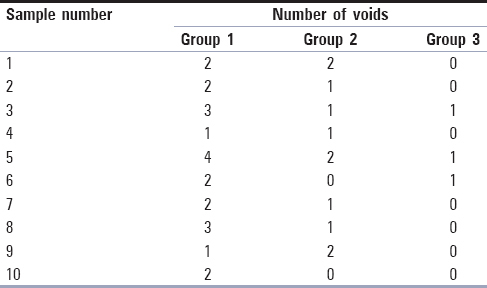 The number of voids observed microscopically, were recorded and tabulated, for each sample of all the three groups [Table 1]. 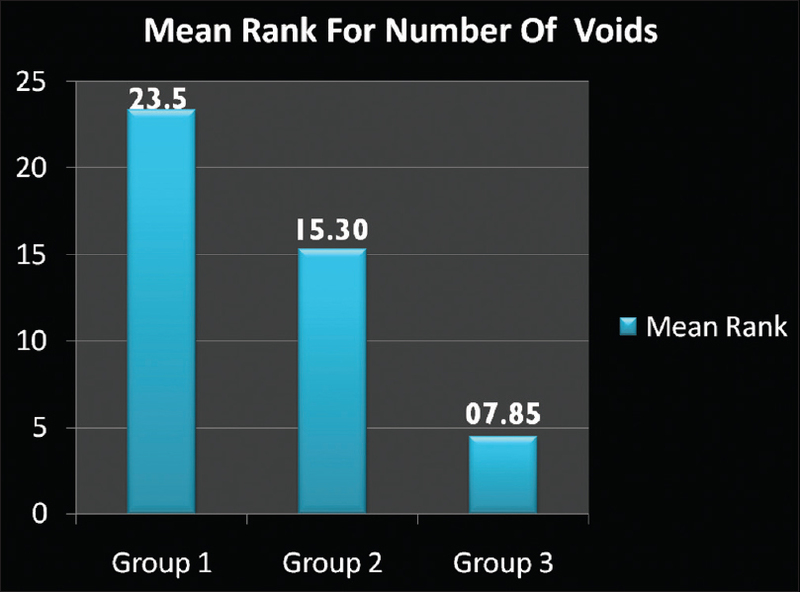 The observations obtained were used for the statistical analysis using the Kruskal–Wallis test, and the mean rank for each group was calculated [Table 2]. The level of significance considered was, P < 0.05. The “P value” obtained here was 0.000, thus the results obtained are statistically significant. The obtained results are expressed graphically [Figure 5]. Endodontic treatment of a tooth with internal resorption has always been a challenge for endodontist. Various methods have been proposed and used for obturation of a tooth with internal resorption. According to Basavanna et al., Obtura II technique produced the best result for obturation of simulated IRC as compared to system B, thermafil, and lateral condensation techniques. Thus, for such cases, thermoplasticized gutta-percha was considered to be superior to the conventional lateral condensation. But with the advent of newer biomaterials, a novel approach to obturate such defects must be taken into consideration. The two biomaterials used in the present study are MTA and Biodentine. In this study, along with the two biomaterials MTA and Biodentine, thermoplasticized gutta-percha is also used for comparing the obturating potential in such cases of internal resorption. Various studies have found thermoplasticized gutta-percha to be superior to the conventional lateral condensation technique, especially in cases with internal resorption. As shown in [Figure 3], the radiographic evaluation of obturation with thermoplasticized gutta-percha shows the presence of voids as compared to MTA and Biodentine which apparently exhibit no macroscopic voids as far as radiographic evaluation is considered. The reason for this might be the difference between the temperature during introducing the material in canal and during condensation. 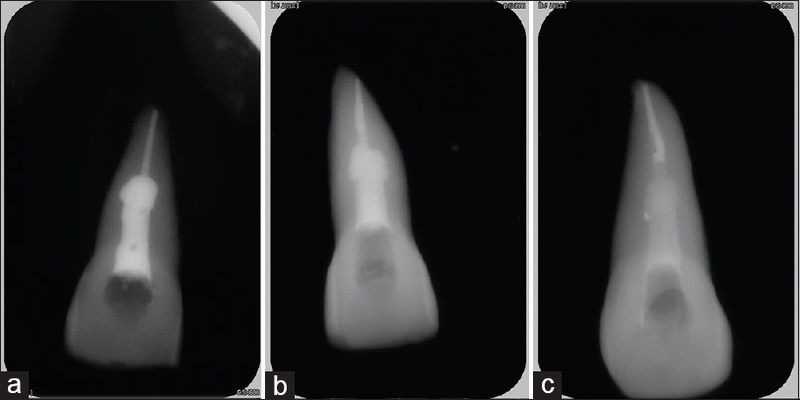 As shown in [Figure 4], the image of thermoplasticized gutta-percha confirms the radiographic findings, whereas the MTA and Biodentine which appeared similar under the radiographic evaluation differed under microscopic evaluation. The samples obturated with MTA exhibited more voids than those obturated with Biodentine. The probable reason may be, a more uniform mixture of Biodentine obtained as a result of mechanical manipulation of the Biodentine capsule in amalgamator. Thus, to evaluate the findings, it can be said that thermoplasticized gutta-percha should be the last option to treat such cases as it does not have enough potential to obturate efficiently and also does not help in curbing the inflammatory process. Comparing the efficiency of MTA and Biodentine in such cases, as far as the bioactivity is considered, they are similar, that is, due to high alkaline pH, they stop the inflammatory process, and thereby curb the progression of resorption. But considering the above radiographic and microscopic findings, Biodentine can be considered superior to MTA. Some of the points which justify this are as follows. However, there are some shortcomings of these materials as well. Since the initial setting time of Biodentine is merely 6 min, when used to obturate the entire tooth, it provides a very limited working time. Also for Biodentine and MTA, they cannot be dissolved and removed so teeth obturated with these cannot be retreated. Obturating the teeth with these materials is very technique sensitive, as it requires efficient skills and proper condensation, without which, there are chances of air entrapment leading to voids. Thus, despite all the advantages of Biodentine and MTA,in vivo studies need to be carried out to check exact clinical efficiency as an obturating material, especially in cases like internal resorption. Thus, within the limitations of this study, it can be concluded that Biodentine has a better obturating potential than MTA and thermoplasticized gutta-percha in conditions such as internal resorption. Chauhan R, Tikku A, Chandra A. Detection of residual obturation material after root canal retreatment with three different techniques using a dental operating microscope and a stereomicroscope: An in vitro comparative evaluation. J Conserv Dent 2012;15:218-22. Shenoi PR, Makade CS, Kubde R, Badole GP, Patil VD, Dhande VM. Comparative evaluation of different techniques used to obturate experimental internal resorptive Defects – An in vitro study. Endodontol 2014;26:286-90. Goldberg F, Massone EJ, Esmoris M, Alfie D. Comparison of different techniques for obturating experimental internal resorptive cavities. Endod Dent Traumatol 2000;16:116-21. Nguyen NT. Obturation of the root canal system. In: Cohen S, Burns RC, editors. Pathways of the Pulp. 4th ed. St. Louis: C.V. Mosby; 1987. p. 183. Walton RE, Torabinejad M. Principles and Practice of Endodontics. Philadelphia: W.B. Saunders; 1989. p. 224. Agarwal M, Rajkumar K, Lakshminarayanan L. Obturation of internal resorption cavities with 4 different teachniques: An in vitro comparative study. Endodontology 2002;14:3-8. Gencoglu N, Yildirim T, Garip Y, Karagenc B, Yilmaz H. Effectiveness of different gutta-percha techniques when filling experimental internal resorptive cavities. Int Endod J 2008;41:836-42. Singh S, Kulkarni G. Resorptions revisited – Internal resorption – Two case reports. Endodontology 2013;25:129-34. Heithersay GS. Management of tooth resorption. Aust Dent J 2007;52:S105-21. Mittal S, Kumar T, Mittal S, Sharma J. 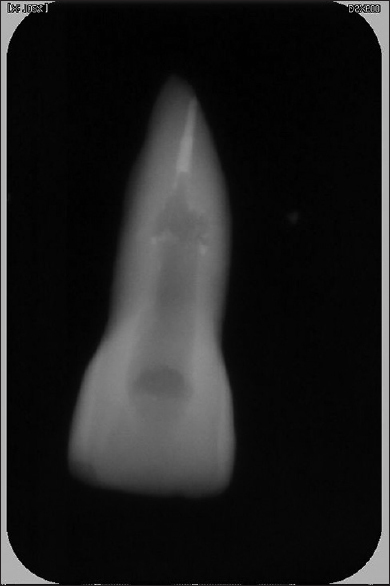 “Internal root resorption: An endodontic challenge”: A case series. J Conserv Dent 2014;17:590-3. 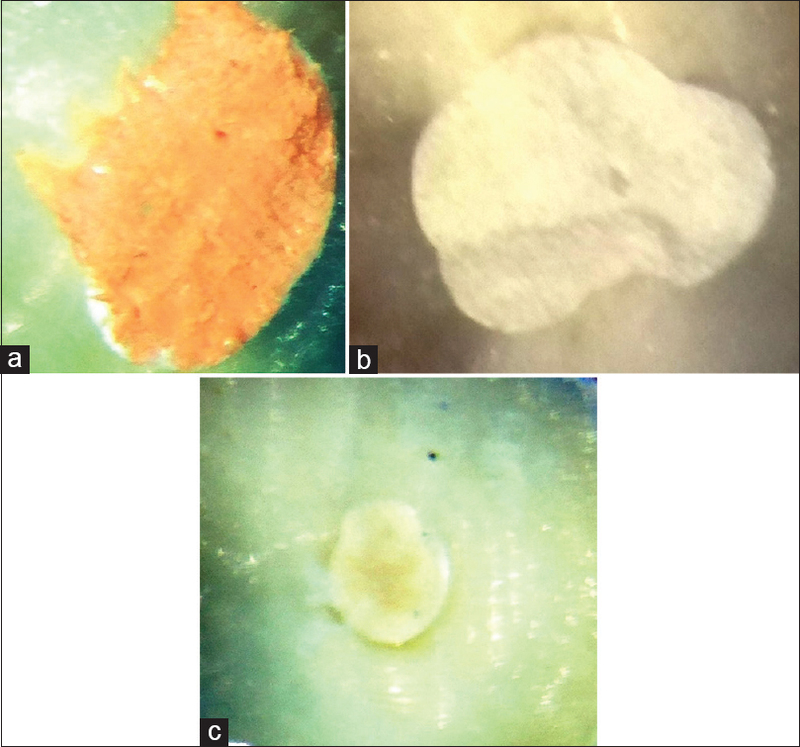 Basavanna RS, Kumar DN, Pendharkar K. Effectiveness of four different gutta percha techniques in filling experimental internal resorptive lesions – An in vitro study. Endodontology 2014;26:128-36. Mohammad Y, Alafif H, Hajeer MY, Yassin O. An evaluation of guttaFlow2 in filling artificial internal resorption cavities: An in vitro study. J Contemp Dent Pract 2016;17:445-50. Keles A, Ahmetoglu F, Ocak MS, Dayi B, Bozkurt A, Orucoglu H, et al. Comparative analysis of three different filling techniques and the effects of experimental internal resorptive cavities on apical microleakage. Eur J Dent 2014;8:32-7. Bogen G, Kuttler S. Mineral trioxide aggregate obturation: A review and case series. J Endod 2009;35:777-90. Raftery P. Why (And When) I Love Biodentine. Denplan INSIGHT Magazine; May, 2014. Umashetty G, Hoshing U, Patil S, Ajgaonkar N. Management of inflammatory internal root resorption with biodentine and thermoplasticised gutta-percha. Case Rep Dent 2015;2015:452609. Kaup M, Schäfer E, Dammaschke T. An in vitro study of different material properties of biodentine compared to ProRoot MTA. Head Face Med 2015;11:16. Priyalakshmi S, Ranjan M. Review on biodentine – A bioactive dentin substitute. IOSR J Dent Med Sci 2014;13:13-7.